As a creative studio founded on research and immersive experiences, Holition field-tripped to Selfridges’ ‘The Flipside’ on a quest to experience and review the “altered states of luxury” that were on offer from Louis Vuitton, Thom Browne, Gareth Pugh, Loewe, Mr Lyan, Byredo, Google and Selfridges. Gathering outside the concrete backside of Selfridge’s, we awaited the opening of the vault-like entrance, prepared to be awed by the curation and creation of designers and tech giants alike. At 12pm sharp, the spherical door twisted open and our exploration of modern luxuries began. Entering into an unbranded ‘play’ area, we danced around boulder-like mirrors and a well-dressed crowd, navigating between the masses as they snagged selfies. Slightly confused about the purpose of the mirrors, we commandeered a staff member. We were told there were quotes on the back of each mirror to explore but the narrative ended there. Leaving the mirrored area in search of the first designer space, we followed the crowd to a collage of plants and electronics that Loewe had curated in perspex columns. Glossing our eyes over the unidentified floor to ceiling plants and vintage electronics collections, we left, slightly perplexed, hoping that the next part would give us something with deeper meaning to chew on. As we approached the Libationary, we were handed instructions which told us to choose still life A, B or C according to which objects caught our attention, then to answer the questions within the matching section on our paper ballot. Completing the exercise, we felt that by only answering three diagnostic questions, our results (hyper-personalised cocktails) perhaps weren’t as accurate as they could have been, but the tiny taste of tipple was a nice touch! After the cocktail tasting, we studied Thom Browne’s ‘Dreamscape’. The designer’s theatrical S/S18 pieces illuminated and disappeared behind an intermittent fog over the glass casing. The exposé showcased the craft and imagination built into the pieces, but we left wanting more than just fashioned silhouettes. From one theatre to the next, we delved into Gareth Pugh’s ‘Void’ video installation, which was meant to prompt ‘an awareness of being’ as viewers positioned themselves between two deserted digital beaches. The black sand flooring provided a nice contrasting texture to the visuals, but we didn’t necessarily feel more aware as we stood motionless, awaiting something more. Louis Vuitton’s ‘Radical Journey’ intended to provoke thought around the future of travel, yet it’s floating islands of crystals were slightly lost at sea. It was only after we accidentally bumped one of the islands that we discovered the pastiche of gems, flora and glass objects actually moved. Perhaps more UX would have been helpful to point this out earlier because the moving glimmers of light from the floating islands provided for a great use of Kira Kira! Selfridge’s part in the exhibition was ‘The Shadow Dial’, where viewers could explore the concept of time through a projected mashup of a sundial and analogue clock atop a terracotta plinth. The last part of the exhibition was (ironically) the most interactive: A ‘luxury portrait’ by a Google Pixel 2. 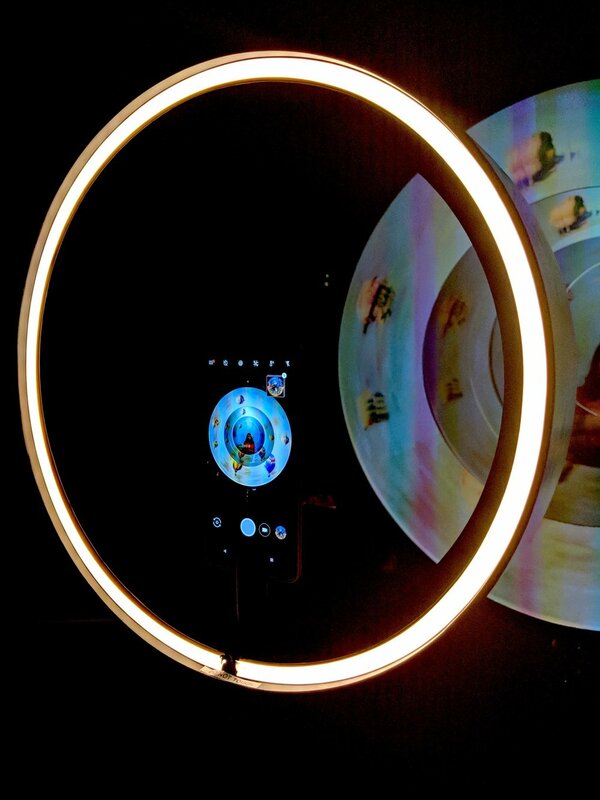 We spun a dial to choose a background on the three circular screens, after which a Google Pixel 2 propped up via tripod, made a gif out of four quick photos. The printout and gif were memorable takeaways and were a positive finale to the exhibition. Although aesthetically the exhibition, in parts, was stunning, we couldn’t help but feel that ‘The Flipside’ lacked deeper stimulation and meaning. The entire exhibition only touched the surface of luxuries such as time, water, materialism, personalisation and pastimes through a seemingly one-way conversation, with the eight-part journey showcasing what we consume, but never exploring how we attribute worth. What the exhibition lacked was value. What is ‘value’ though? The nature of the word is relative and inherently social. As defined by psychologist, Dr. Jordan Peterson, “value, in all senses of the word, is a social issue,” created by hierarchies and constructs, in which we create webs of meaning and tag them with a price, based off of our tenderment. In an attempt to characterise meaning and value, Peterson marries neuropsychology, cognitive science, and Freudian and Jungian approaches to mythology and narrative to outline that value structures are meant generate various outcomes, or conversations. In Peterson’s lectures, he discusses that we all have intrinsic value structures that impact how we establish meaning. Within these structures, we’re constantly in conversation with ourselves and others to validate the meaning of each exchange or experience. Each validation is a conversation, stemming from the way we sense, feel, act, relate and think about something. These impressions culminate into a complex social ecosystem, in which our utilitarian, hedonic, symbolic and economic perceptions are funnelled together to establish value of something in comparison to something else. So what this means is that to drive value, experiences must function as social ecosystems, by offering various meaningful exchanges and conversational stimuli. So how the hell do you build a social ecosystem? First, we need to define what makes up the fibre of an experience, then we can piece them together to see how they work as a meaningful experience or ecosystem. We must remind you that designing meaningful experiences is, without a doubt, challenging, ever-evolving and can throw a curveball to even the most established storytellers and curators. Looking to seasoned veterans Joseph Pine II and James H. Gilmore, let’s begin with the anatomy of successful consumer-facing experiences. The pair, who have been defining this since 1998, dissected a variety of experiences, consumer opinions and the experience-based economy. Deep-diving into why consumers unquestionably desire experiences, the theologists looked to human nature for inspiration. Plotting their research and hypothesis on a matrix comparing levels of participation against absorption or immersion, Pine and Gilmore fathered the “Four Realms of an Experience”; and despite the age of the framework which emerged pre-digital, much of what it suggests is still applicable today. Now taking ‘The Flipside’ into consideration, we can first start on the x axis, comparing the participatory elements within the exhibition. Considering that Mr Lyan’s ‘Libationary’ was the only stage out of eight that required active participation and all five senses, Holition have positioned it as quite a passive exhibition. Pine and Gilmore define the y axis as “a connection, or environmental relationship, that unites customers with the event or performance.” Since the exhibition was mainly a one-sided conversation from designers and artists, we’ve plotted it towards absorption. By joining the two points together, we can see that ‘The Flipside’ was heavily weighted towards a passive entertainment experience. Straddling the centre, is value, which we can see is out of reach from where ‘The Flipside’ sits. All in all, creating ‘meaningful’ experiences is a difficult feat, because it requires building a social ecosystem out of a basic understanding of economics, physics and behaviour and establishing a series of value exchanges. What’s more, is allowing the ecosystems to run their organic and natural flow, welcoming diversity in opinion, choice and meaning, and unfortunately, ‘The Flipside’ just didn’t cut it. Rather than engaging audiences through entertainment, education, escapism and esthetic, it initiated a one way conversation, predefining value through limited experience. All in all, Holition thought ‘The Flipside’ had great potential to be a valuable exposé, given the impressive lineup of collaborators, but sadly, we regret to say that the exhibition fell short of our expectations. Based off of UX, subject matter, impact and aesthetic, Holition gave the exhibition a 5.5/10.